Emma Schlachter grew up on the Central Coast of NSW. 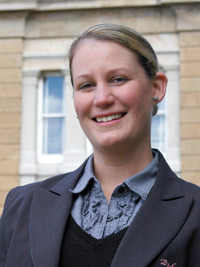 After completing her Bachelor of Laws/Bachelor of Arts at the University of New England, she moved to Cooma in early 2007 where she commenced both her graduate diploma in legal practice through the Australian National University and working at Blaxland, Mawson & Rose. Emma was admitted as a solicitor in February 2008. Emma regularly acts as the Legal Aid Duty Solicitor for Cooma and Bombala Local Courts; and has a number of years’ experience in representing clients before both the Local and District Courts in the south-east region, including in complex criminal matters. Emma practices predominantly in the area of criminal law but also undertakes civil matters, conveyancing work and wills and probate administration. In November 2012 Emma completed her Masters in Applied Law, specialising in Wills and Estate Administration. Emma is also a past Young Lawyer representative for the Far South Coast Law Society. Emma became a partner in July 2018. Emma is available for appointments in our Cooma and Bombala offices.